The angry atheists have been center stage in the God debates over the last few years. Many of them have become household names. Often giving sweeping generalizations about what God is, they tear apart this highly improbable image with aplomb. Not that I like to get in the way of somebody’s innocent fun, but their approach to the question only antagonizes the opposition without converting them. 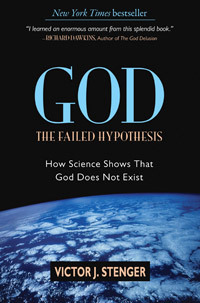 I just finished Victor J. Stenger’s God: The Failed Hypothesis. Like many who argue for atheism, Stenger is a highly regarded scientist. Unlike many, he offers a systematic, even-keeled account of his reasons for rejecting the divine. Indeed, the sub-title is straightforward—prosaic even—How Science Shows That God Does Not Exist. As befits a physicist, Stenger is careful to define his terms and is cordial enough to state that his book doesn’t cover the non-existence of deities per se, but the interventionist God of yore in particular. Although I can’t agree on every single point Stenger makes, he does a compelling job of laying out logically how, if God is taken as an hypothesis (theory is a little too strong a category, implying substantial scientific concurrence), there should be some measurable result in the universe that God created. Choosing to differ from many theologians and scientists, Stenger argues that science can say something about God, given that God reputedly acts in a physical world. Outside these parameters something one may choose to call God may exist, but that kind of God does not answer prayers or oversee evolution. Like many scientists, Stenger feels compelled to undertake this argumentation at least partially because of the weary insistence that evolution is “just a theory.” Creationists have tried to distort science for nearly a century now and have been successful really only in the United States. As Stenger shows, their method is often science, but wrong science. Just because an idea is scientific does not made it valid science. Stenger also points out that the premises of creationism, no matter how measured, are just plain wrong. Throughout, however, there is no belittling of those who believe in God. What is offered in this little volume is a rational, non-hysterical account of why a physicist who follows the law of the kingdom finds there is no God above it. And like a true scientist, Stenger leaves open the possibility that new evidence could overturn his verdict. Nevertheless, if his work is taken seriously, such a turn of events appears highly improbable. No visit to Providence is complete without a tip of the hat to H. P. Lovecraft. As someone who dabbles in the noble art of writing, I have great appreciation for those who somehow made an impact (often only after they’ve died) on the literary world. I discovered Lovecraft only after I left Nashotah House, which was probably a good thing. Nevertheless, I have come to appreciate his breadth of vision, populating the earth with ancient gods who emphasize the powerful and heartless side of divinity. His vivid images of Cthulhu pervade popular culture to a level that few of the uninitiated would ever expect. And yet, deep in the depths he lurks. So when I was in Providence over the weekend for my niece’s graduation, I spent an afternoon seeking out some time with H. P.
Place inherently partakes of that we term holiness. Where something happened matters. There is no science to explain it, but it is something people know. It is for this reason that I try to visit the homes and resting places of classic writers. Over the years we’ve visited the haunts of Mark Twain, Laura Ingalls Wilder, Edna St Vincent Millay, Washington Irving, Edgar Allan Poe, and others, as well as H. P. Lovecraft. Simply standing in or near the places they once frequented provides a form of inspiration unavailable in any other way. 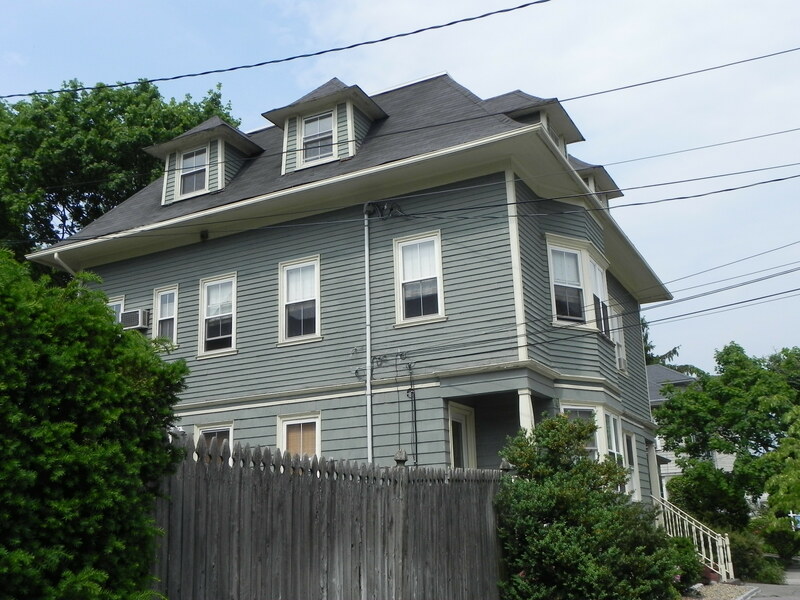 So it was that I found myself at 598 Angell Street in Providence. It is a house still occupied, with no indication of who once called this building home. Lovecraft lived here from 1904 to 1924. If it weren’t for the Lovecraft walking tour I found on the Internet, I would have never known. In many ways a provincial man, Lovecraft was born and also died in Providence. Apart from a stint in New York City, he spent his time in his hometown. I walked to 454 Angell Street, the address at which he was born. I knew the building had been razed in the 1960s, but I wanted to see what society deems more important than preserving those places that sequester the holy for haunted pilgrims. 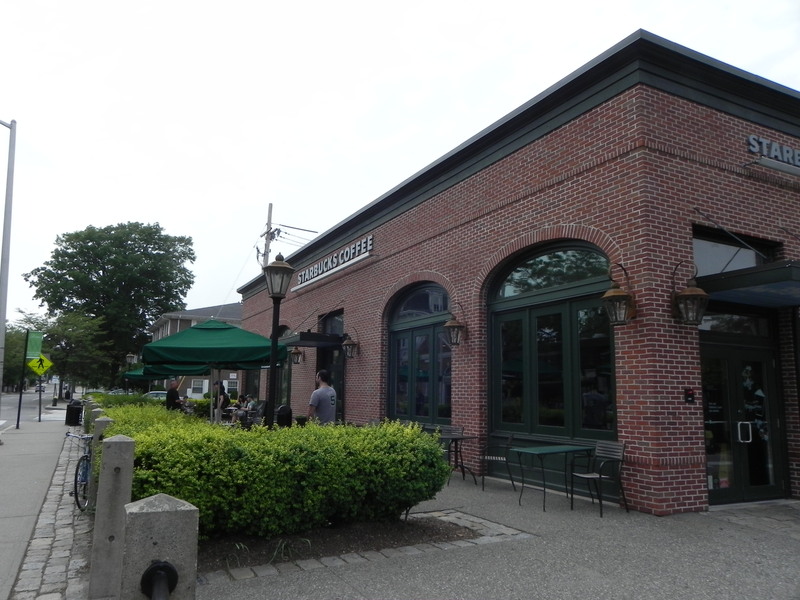 Although I couldn’t tell for sure, since house numbers change, I believe his birthplace is now the Starbucks that sits pleasantly in a small commercial district. I wonder how many of the thirsty realize where they’re sitting. Have they read any of Lovecraft’s stories? If so, are they uncomfortable sipping coffee in such a spot? Or perhaps it has become a kind of secular sacrament—a toast to all artists whose pasts have been obliterated. Providence is not always as assured as the divine aid its name suggests. Rhode Island’s capital, like most cities, hosts significant dualities—people who have more than an abundance and those who struggle to get by. There are also those who don’t. In an effort to revitalize the downtown, artists have created WaterFire—an organic sculpture bringing together the pre-Socratic four elements, but focusing on the two encompassed in its name. 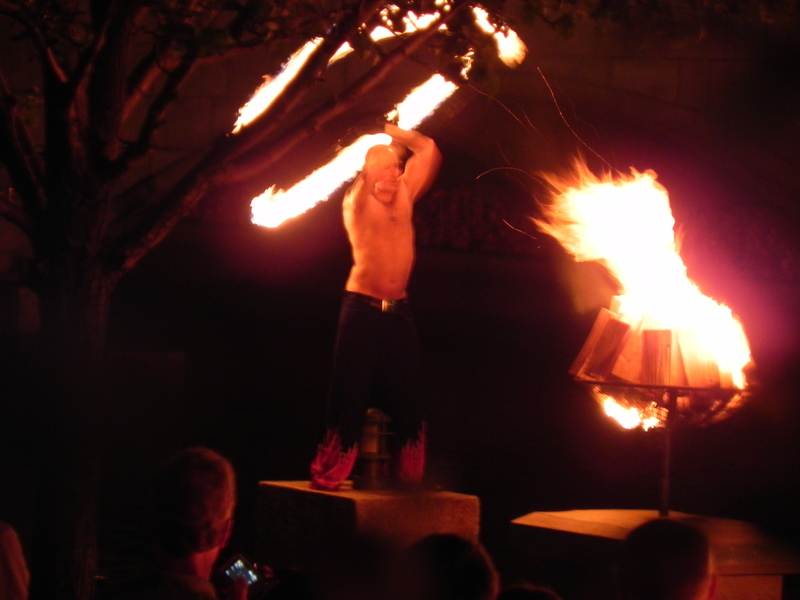 Great braziers are dot the middle of Providence’s rivers and WaterFire is a new performance art that suggests a religious underpinning. On Saturday, during Brown University’s commencement exercises, WaterFire was performed. Watching fire erupting in the iron braziers as the fire dancer twirled flaming sphere in intricate and dangerous patterns, I felt a primal sense of awe. Indeed, the fire dancer’s motions would be classified as religious by anthropologists in an unfamiliar context. Religion is generally a response to that which we cannot control. Conscious beings like to think they have some measure of control over their destinies—indeed, people behave that way constantly. It doesn’t take much, however, to demonstrate that our sphere of control is actually miniscule and tenuous. Religions assure us that some cosmic older sibling (whether deity or force or principle) is on our side, watching our backs. Ceremonies propitiate any angry being and bring us back into the graces of elements beyond our control. Is this not the very meaning of the name Providence? Watching the blazing bonfires tracing the contours of the river, lit by a dancer in time to moving music, WaterFire felt like more than simple performance. Fire is a powerful element, necessary and dangerous to our existence. Water too is crucial, but threatens to overwhelm us as our planet is mostly covered in it. Earth and air often seem the more comfortable elements, often inert and unconsidered. We never confront fire or water in the natural world without giving pause to consider their significance. Whether it is crossing a river or opening an umbrella, water forces itself onto our consciousness. Fire even more so. WaterFire taps into something vital and may just be the real divine guidance that Providence requires at this time. 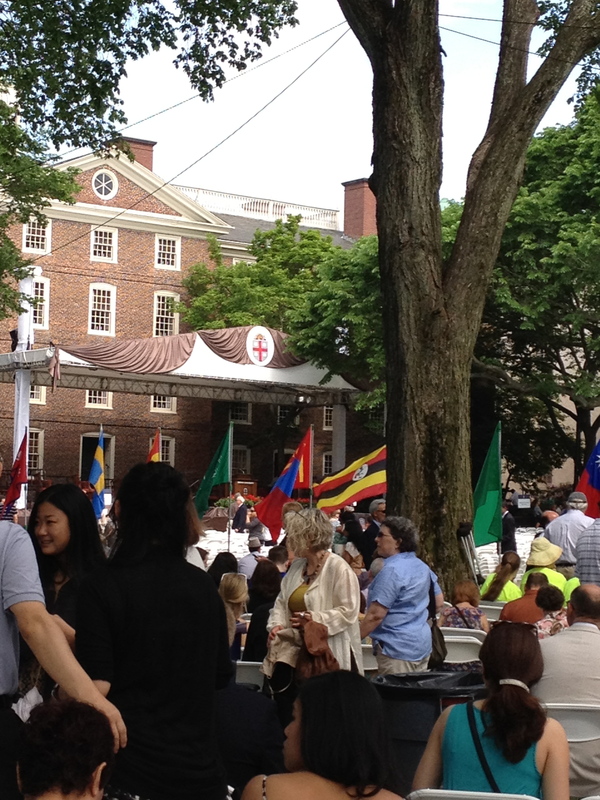 Brown University’s commencement ceremonies include a deluge of academic mythology. The curse of my chosen field of academic study is the tendency to see mythology everywhere. Some individuals see dead people, others see myths. I always feel an inordinate sense of pride in the graduates, especially those who are related to me, but the whole arrangement takes part in the mythology of higher education. Who wouldn’t feel awe in the presence of the illustrious recipients of honorary degrees? There on the Jumbotron, Viola Davis, Marilynne Robinson, Diane Sawyer, and John Lewis. In the program book the seemingly arcane symbols of academia are explained. These are the scriptures backing the mythology. I always wondered why some old professor always carried a mace in academic processions. But the mythology of higher education runs deeper than the symbols and ceremonial. Education itself is under intense fire for participating in the realm of finance that it helped to create. Despite constant affidavits to the opposite effect, there is more to life than money. The cost in educating our young requires a greater input than becomes obvious in the immediate return on the investment. Often I hear concerns expressed over the cost of higher education, and there are certainly excesses that must be addressed. The real profit in this transaction, however, is our future. Who can look at the ocean of mortarboarded potential and not feel, deep down, a sense of optimism, no matter how guarded? The mace is a symbol of violence. Education, if done right, is violence against ignorance and ossified old ways of prejudice, discrimination, and selfishness. For those of us who have tried—and some of us have not been successful—to shed some light on future generations, commencement is a humbling experience. While at Nashotah House I sat through many of them, and sometimes the mythology mingled with hypocrisy as I saw raw hunger for power and the lust to control the lives of others. It was refreshing to experience the mythology anew in a setting where genuine hope seemed to linger among faces full of optimism and pride of achievement. Perhaps it was the obvious inclusiveness instilled by outgoing president Ruth J. Simmons, but prayers by women clergy, and honorary degrees conferred across the spectrum of humanity are signs of hope. The mythology of academia is one myth worth believing in, if it is truly a commencement. “And it came to pass, when men began to multiply on the face of the earth, and daughters were born unto them, That the sons of God saw the daughters of men that they were fair; and they took them wives of all which they chose.” Genesis 6 begins with one of the most unusual stories in the entire Bible. And that’s saying something! The sons of God mating with the daughters of men? A couple verses on we hear about giants roaming the earth in those days, presumably the children of this divine-human miscegenation. What is this stuff straight from pagan mythology doing in the pages of Holy Writ? Over the centuries, translators have tried to tidy up the boldly direct language of the King James here, making the sons of God into angels or some lesser beings. It is too hard to accept that sacred scripture admits of polytheism. Monotheism, it is clear, came to the Israelites somewhat late in their history. The Bible is full of bold clues that other gods exist, and, worse yet, they are sometimes as powerful as Yahweh. In the light of later theological development, translators often bow to popular pressure and clean up the Bible’s language a bit. Fact is, Israelites, like most ancients, lived in a world populated with mythical creatures. Gods galore, monsters, demons, angels, witches, giants—they all haunt the pages of the western world’s sacred book. But that’s not what we expect the Good Book to say. The Hebrew text here is unequivocal, these are the “sons of God” we are talking about. Either that, or worse, “the sons of the gods.” More and more deities. We can’t be sure why the ancient believed in monsters and giants, but it seems likely that such creatures had explanatory value for their world. Lacking science—paleontology was millennia in the future—they had to explain the huge bones found in the earth. We do know that dinosaur bones had been discovered in the Mediterranean basin in antiquity. These big bones often look human to a non-specialist. Heads are frequently missing. It has been suggested that these give rise to our biblical giants. 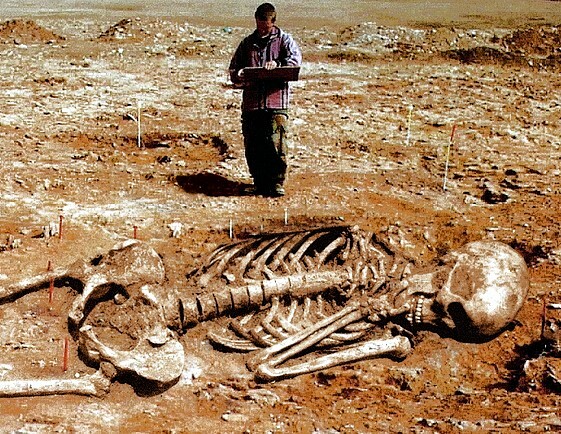 Yet another response has been the recent trend of fundamentalists with Photoshop skills to post photos of archaeologists actually discovering giants on the Internet. Some of these doctored images are very impressive. It is an effort to save the Bible from the truth. A Bible that requires saving, however, should give even the most fervent believer pause for thought. Isn’t it just easier to suggest the sons of God were typical guys and that little has changed since the world was young? It took a few weeks and five states, but I finally got to see Dark Shadows. Although I’d seen the trailers, there was quite a bit over which I remained in the dark. After all, the television series ran daily for several years and the story of Barnabas Collins was never really resolved, to the best of my knowledge. Trying to fit all of that into a couple hours of cost-intensive Hollywood showmanship would be a tall order. I have come to trust the Burton-Depp collaboration, however, and I had read some time ago that Johnny Depp had wanted to be Barnabas Collins when he was growing up. It is difficult nevertheless to resurrect a vampire after some three-and-a-half decades of slumber. 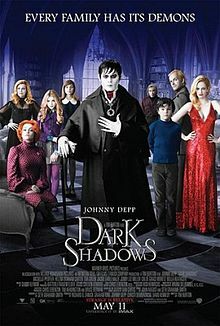 Speaking with some friends after the movie I discovered that I was not the only child discouraged from watching Dark Shadows after school as a child. But watch I did. Barnabas Collins became a monster as the result of a curse. The series—which I remember principally as a series of impressions and images—and the movie make that clear. The man who has lost control of his own fate is a reluctant monster. An aristocrat who lives by draining the blood of the common folk. Despite the humor and carnality of the movie, social commentary is there. Sometimes buried in an iron coffin, and sometimes in a vintage VW bus from the early ‘70’s. It may not appear full blown on the big screen but it pulses through the veins nevertheless. Barnabas Collins is a reluctant and conflicted vampire, but he does kill others to survive. Why would a kid raised in a religious setting be so drawn to a creature of evil? Perhaps it was because Barnabas was the ultimate penitent. He had to victimize others, but he always regretted doing so. Like any living (or undead) creature, his nature compels him to survive. He is sad about his lot in the world, but is helpless to change it. Like many children of the monster generation I was nourished by a long series of movies featuring impossible creatures, including vampires. The earliest vampire I knew, however, was Barnabas Collins. Although Bram Stoker had set the type nearly a century earlier, my measure of the vampire was the reluctant denizen of Collinwood. Although I read my Bible dutifully, and never missed church, I still found the plight of this lonely monster compelling. The movie may not live up to the standard of all Dark Shadows aficionados, but if it brings a subtlety of moral ambiguity to a generation of absurdly self-assured modern-day fundamentalist children, the curse of Barnabas Collins may really be a blessing in disguise. Back in 1996 an angel was on the big screen. In a manner of speaking. Michael, starring John Travolta as the archangel Michael, may not have been an instant classic but it did have a memorable line or two. 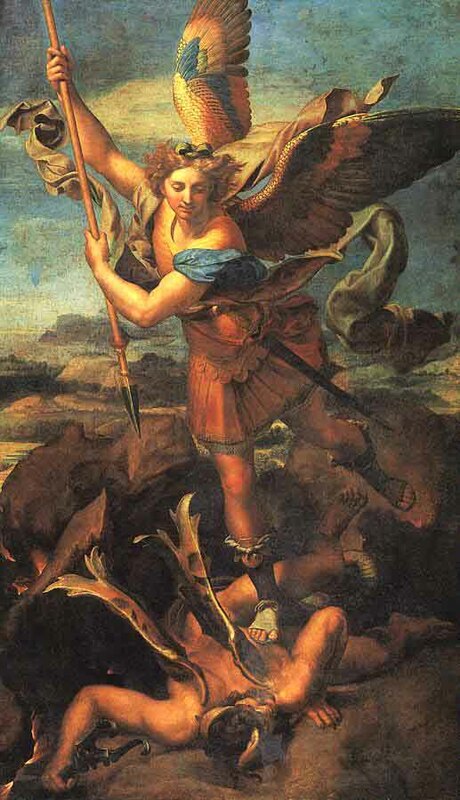 The image of a smoking angel had been contrived by Van Halen over a decade earlier, but the idea of the prince of the army of Yahweh being a guy just like the rest of us was strangely refreshing. No Park Avenue deity this. When the reporters first meet Michael and wonder if he’s the real thing, one suggests tugging on his wings to see if they’re real. Michael responds by asking if he should pull the reporter’s privates to see if they’re really attached. His companion comments, “An angel that says ‘pecker.’” While the very idea of “bad words” is an unusual one, it is well-nigh a universal. In just about every culture there are words or phrases that just aren’t uttered in polite company. Those who can’t control their mouths, suggests the book of James, can’t control their lives. So it is with a kind of perverse wonder that I read about the bullying bravado that issues from the lips of New Jersey’s governor. Don’t get me wrong. I never fault anyone for speaking like they were taught. I was raised in a blue collar family and at times the talk could get pretty blue as well. I would, however, point out that you’ll not find a student I taught over my two decades in the classroom that every heard me cuss in class. It is a matter of standards. Emotions, those great clawing monsters inside us, rage to escape. The building blocks of society—restraint and control, and dare we even wish? subtlety and refinement—are signs of civilization. Some of us were taught to leave name-calling on the playground. I am profoundly saddened when politicians believe they are the best America has to offer when in reality they reveal themselves coarse, vulgar bullies. Enter Chris Christie. In a public venue on Wednesday New Jersey’s governor called the chief budget officer for the Office of Legislative Services, “idiot,” “jerk,” and “numbnuts.” Here’s where we see Tea Party values incarnate. Belittling others, especially in a public forum, reveals a nature that should make all civilized civilians hang their heads in a surfeit of collective shame. America has come to this? Admiring bullies and slashing and burning services for those who need a little communal support? And he has been posturing for a vice presidential nomination. And angels will be smoking cigarettes in the wings. A President/Vice-President who says “numbnuts?” America deserves far better than this. Where is Michael when we need him?